I did hardly any sewing for the holidays this year. But E requested a red dress and wasn’t happy with any of the store-bought choices we found. So I let her pick some red fabric (Riley Blake chevrons for the main fabric and floral print for the band) and got to work. 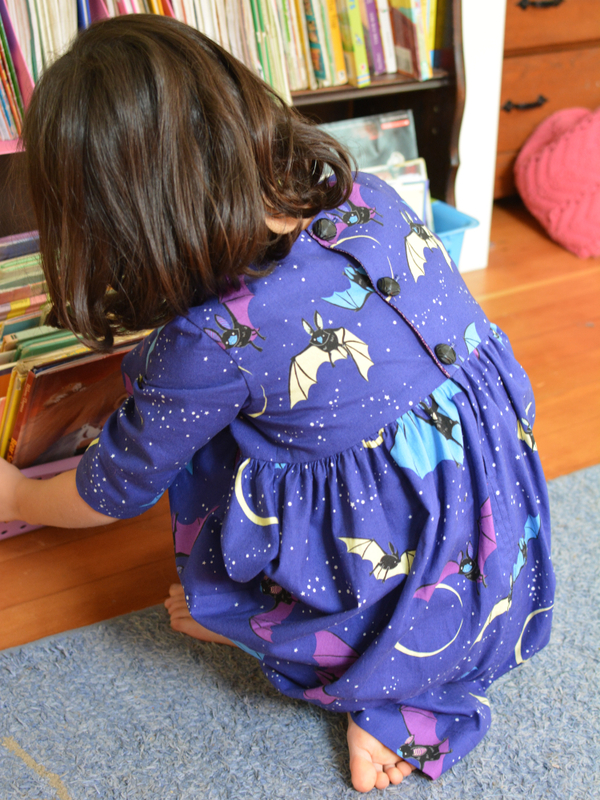 This dress is loosely based on the Oliver+S library dress. I started with the size 3T pieces and modified the heck out of them, somewhat using the tutorial here that I’ve used in the past. I added the fabric band around the entire dress this time and cut two of each bodice piece to create a full lining. I knew with the wild chevrons I wanted the front to be as simple as possible and I wanted to give the thin jersey a bit more substance. I also added quite a bit of length and some width to the skirt pieces so that I could gather them in the front and back. 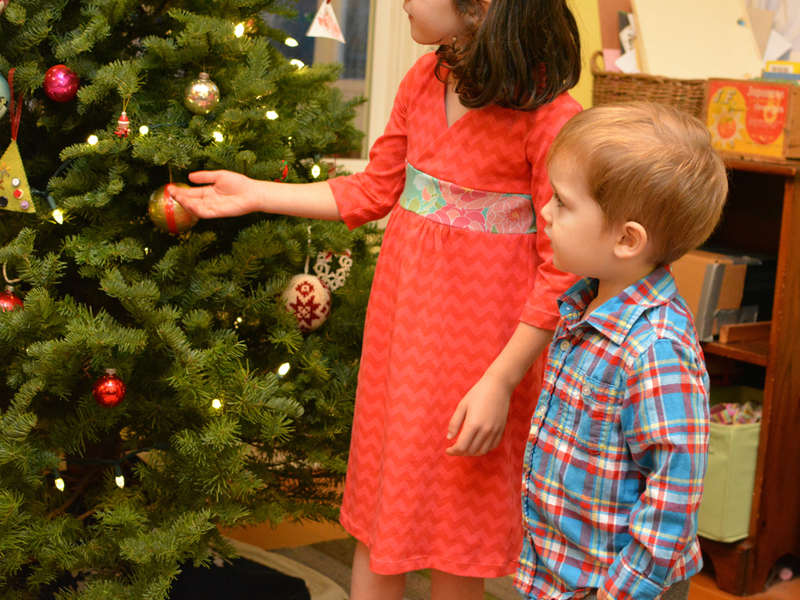 E was happy to have her red dress and wore it on Christmas Eve and Christmas Day. I was making this one up as I went along and was so happy that it fit! For O, I finally got around to trying out the Oliver+S art museum trousers. 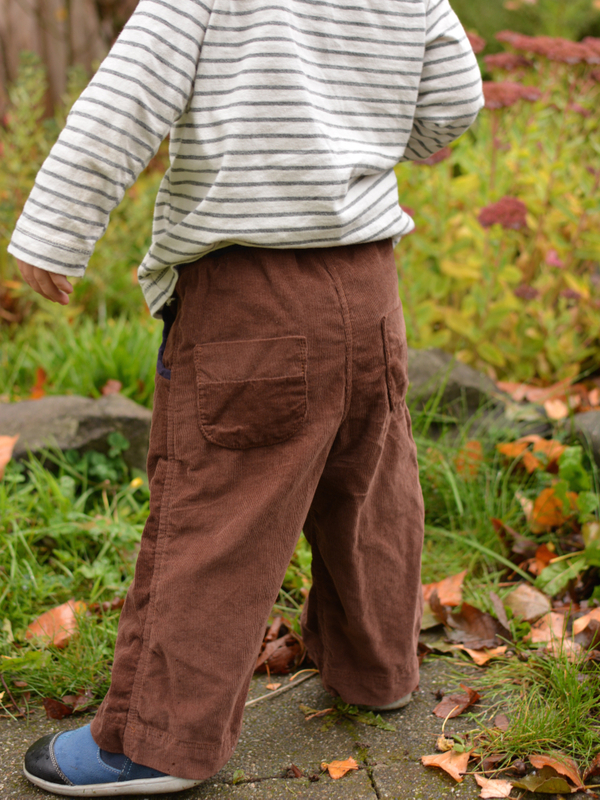 I loved making these pants and he loves wearing them. 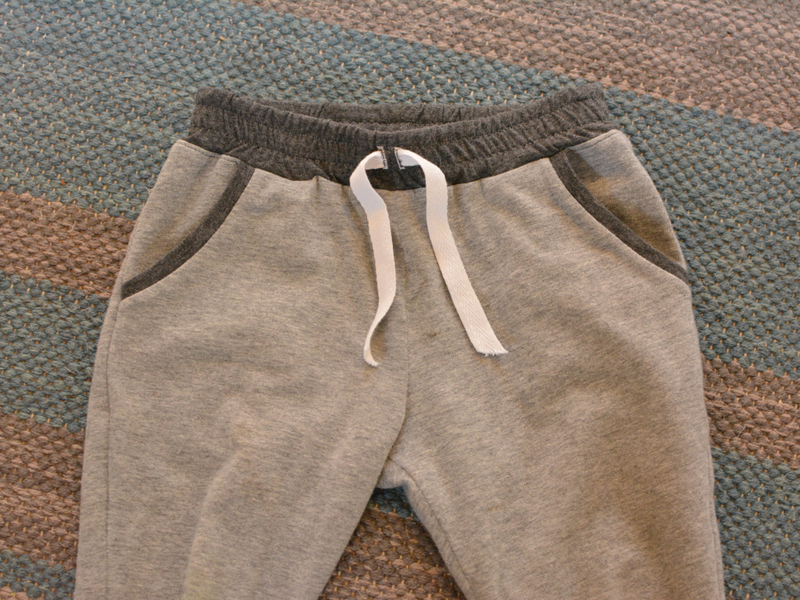 Despite being fancy they are very comfortable and easy for him to pull on and off with the elastic waist and faux fly. The fabric is Kaufman shetland flannel in gray and this fabric was just as lovely as others have found. It was admitidely not the best choice for pants as it’s getting rather fuzzy, as to be expected with flannel. But it is very cozy and I like that it looks a bit like wool without the hassle. 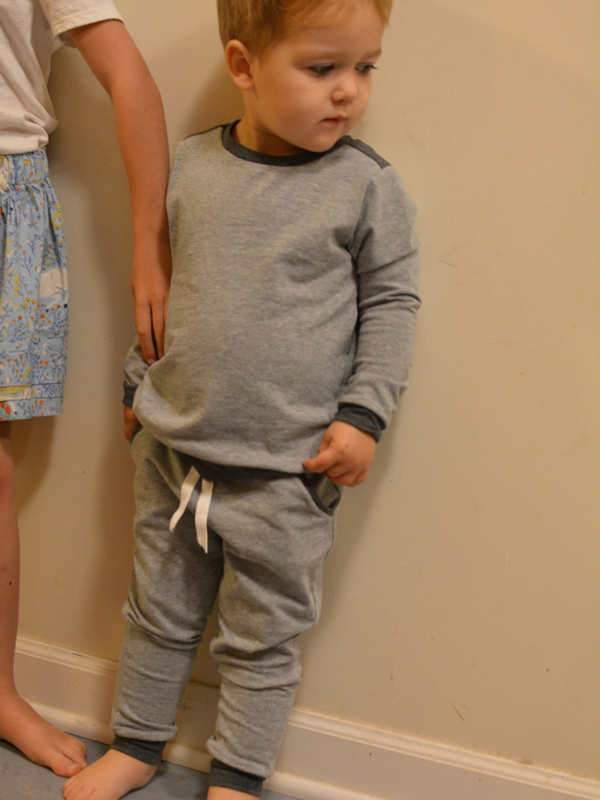 I made these in size 2 and they are plenty long on this tall guy. No need to add length to this pattern. 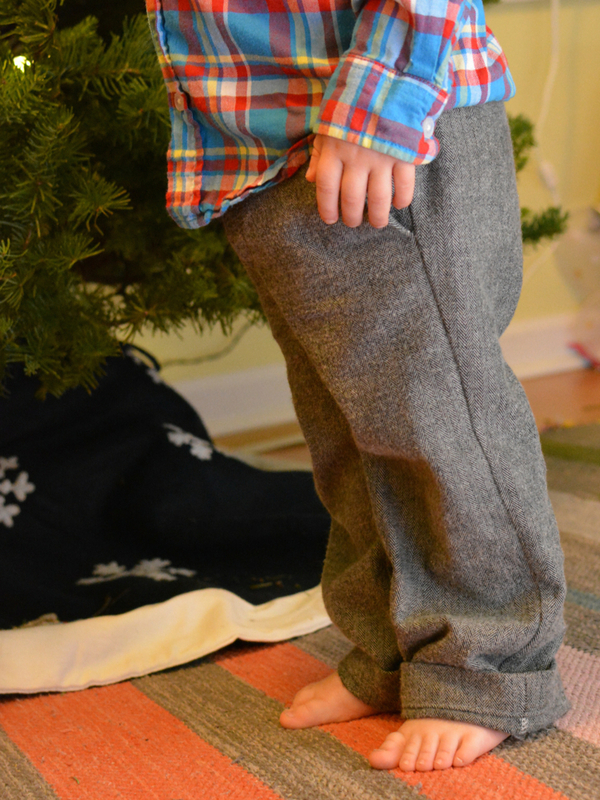 O is embracing his 2-ness and refused to wear these pants on Christmas, but he happily wears them for all other occasions. I want to make this pattern again immediately. Maybe in a corduroy. 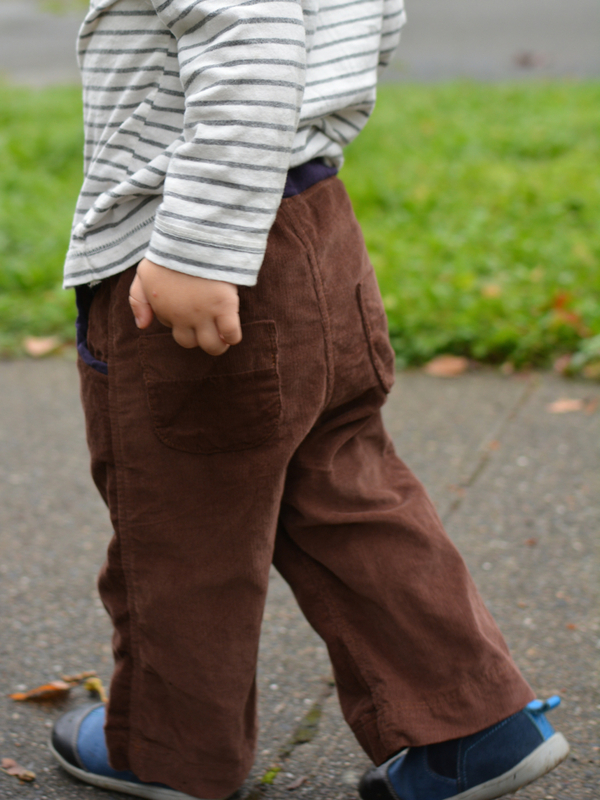 I love those little welt pockets. And the side pockets. 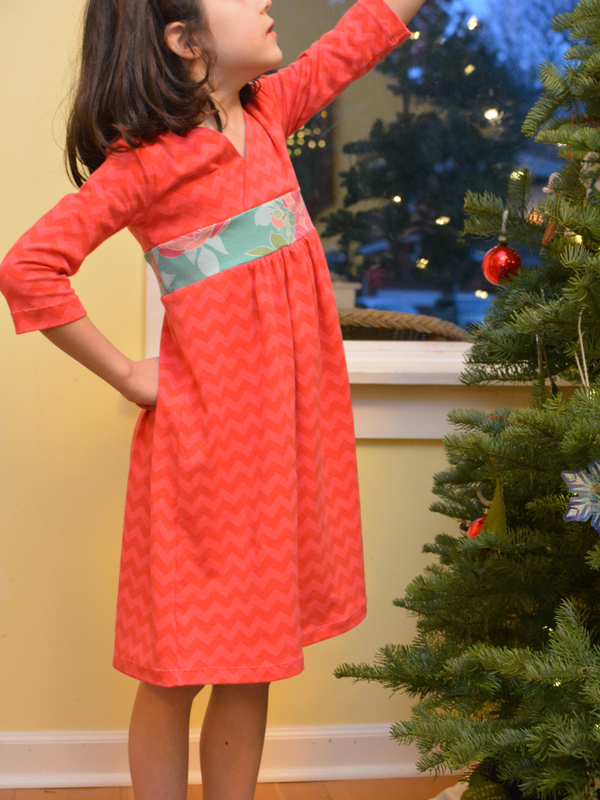 That’s a wrap on my holiday sewing. Hope your holidays were magical! O was in need of some new pajamas so I turned to my favorite combination of Made By Rae flashback skinny tee and Titchy Threads fancy pants leggings. These patterns are well used around here. I had one yard of this Birch print and I knew O would love the bicycles. 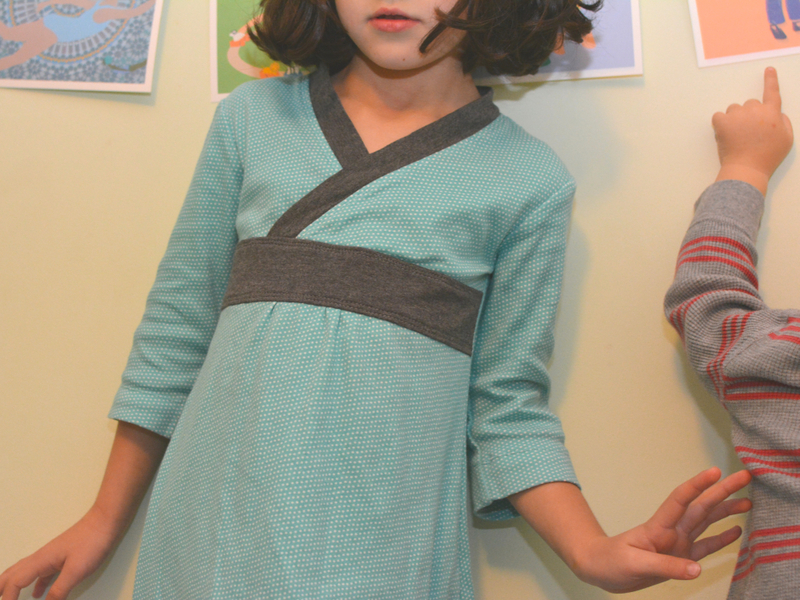 The fabric is a lovely thick interlock that was delightful to sew with and is so cozy to wear. I used kaufman laguna knit jersey for the cuffs, knowing that interlock is not great for ribbing. I was able to fit 2T pants and a 3T shirt out of the one yard of fabric. 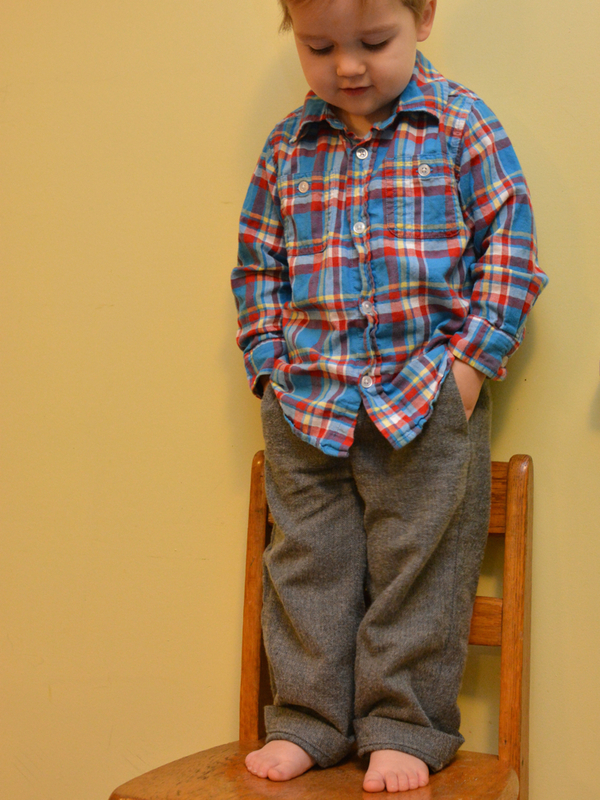 O is solidly in 2T sizes but the flashback is a slender fit so I sized up. I also added a band to the shirt instead of hemming. 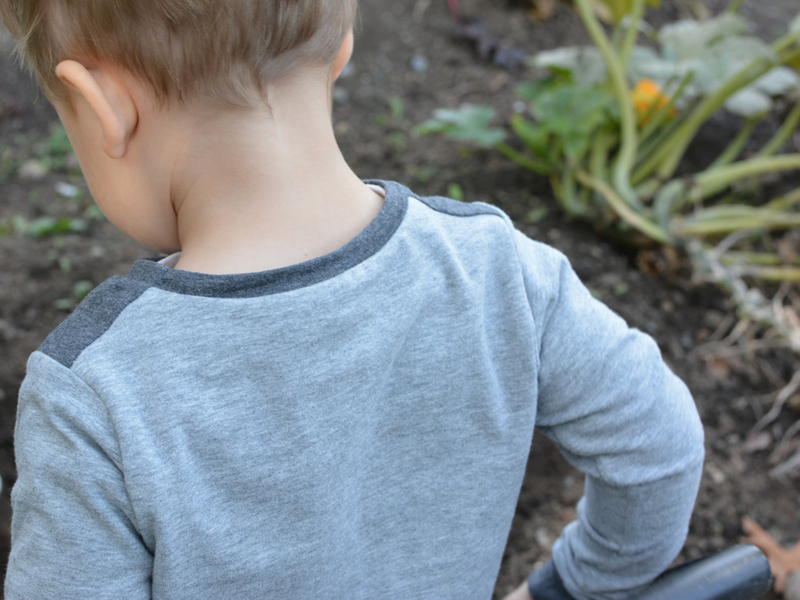 The shirt happens to be on backwards here as O prefers to dress himself these days (and I also forgot to add a little tag to the back neck post-serging). O is on the move as always but he’ll stand still for a moment if you ask him to find a bicycle. So bicycle pajamas, ready for snoozing. Now I should get started on some holiday sewing. I have a few yards of shetland flannel and some corduroy for O and a request from E for a red dress. Hard to believe it is almost December! Since sewing is slow these days I thought I’d pop in here and share a couple of other projects from this fall. First, a little sweater for O. This is a fawn hoodie in Cascade Eco wool (Ravelry notes here). As per some other reviews the sizing on this one seems off. I first cast on for a size 2 but realized it was going to be too small. So this is a size 4, which actually seems like a size 2 with size 4 arms. I enjoyed knitting with bulky yarn (nice and fast) and was happy to add my first zipper to a knit item. The pattern originally closed with two buttons but I thought the zipper was a little less feminine. I agonized over putting in the zipper (it took some blocking and there are a variety of hand stitching methods) but it ended up being quite easy. 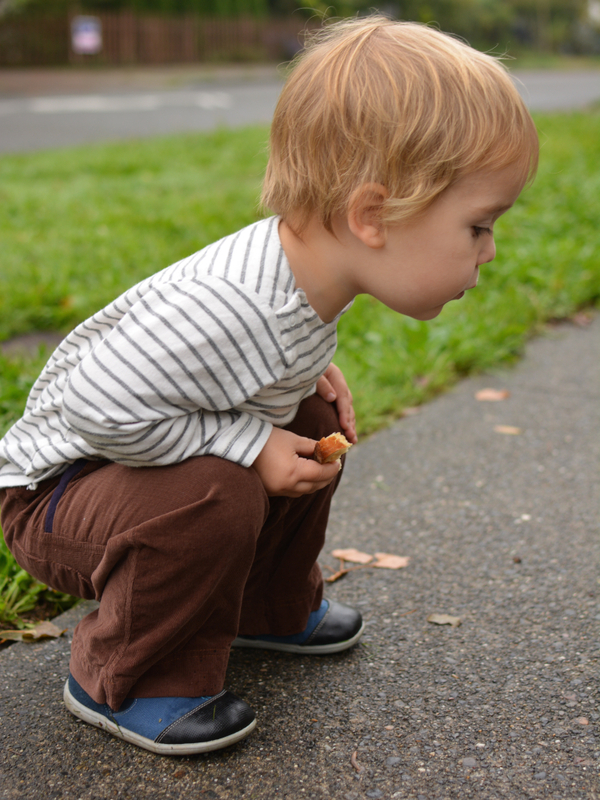 So far O’s shown limited interest. We shall see, seeing as it’s already getting short on his little belly. 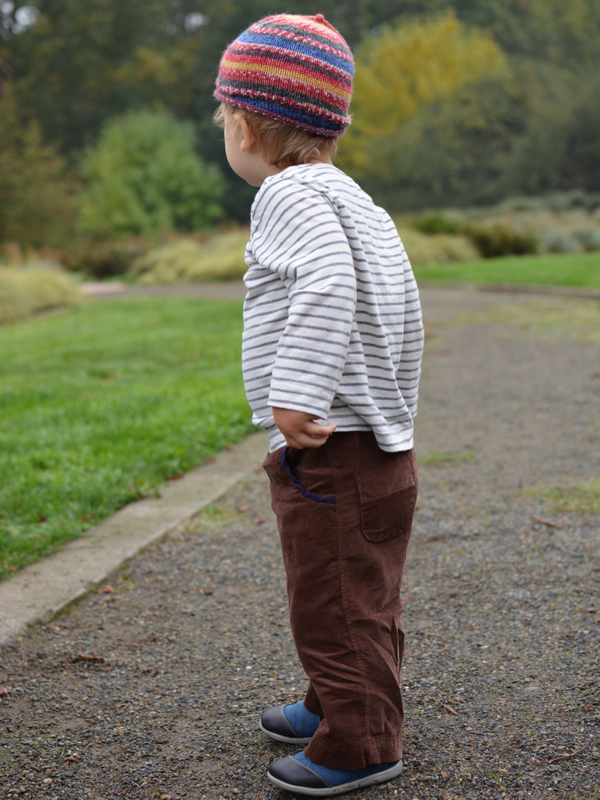 O has also outgrown most of his hats from last year, so here’s another go at the Purl Bee garter ear flap hat (Ravelry note here). O hasn’t taken to this hat (he prefers to wear his sister’s hats) so E kindly modeled this one for a few pictures. I do really love this pattern (although again, I think it runs small). It’s interesting and squishy and I love the shaping. I also really love this Malabrigo yarn- great color variation and texture and not too heavy. Last up, I finished the Winterwoods ABC sampler from Alicia Paulson. I loved this kit. The materials were just so lovely. The embroidery thread is hand-dyed with such beautiful color variation and the pictures are so sweet. E really enjoyed watching me work on this and seeing the various letters and images take shape. I now need to find the best place to put it up. To be honest cross stitch turned out to be not my cup of tea (as E’s kindergarten teacher has the kids say), as it was hard to get into any rhythm when constantly counting tiny squares. But the materials were so lovely that I may buy her new alphabet sampler anyway. Looking at these pictures makes me ready for the cozy winter season. I may need to search out a little yellow tea kettle. I think it was my favorite picture to complete. At E’s school, each classroom is represented by an animal. 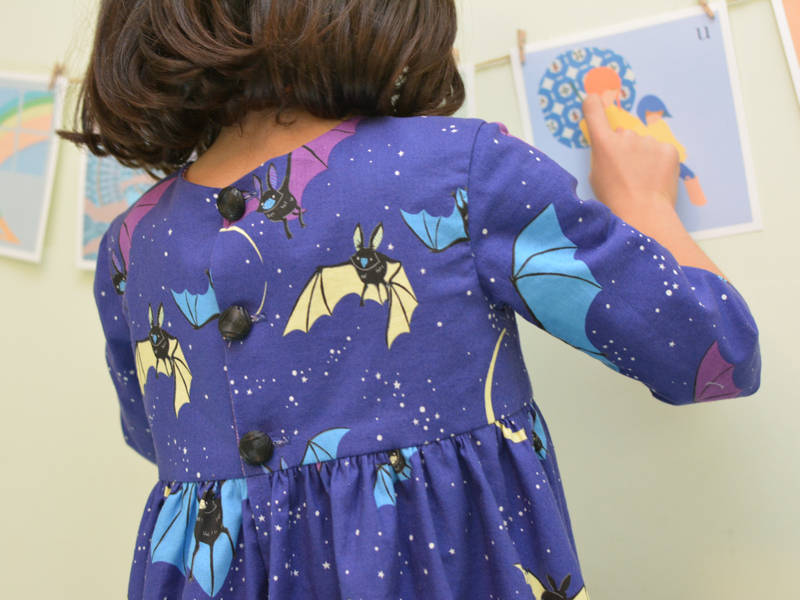 E’s room is the bats and she asked if I’d make her a bat dress. 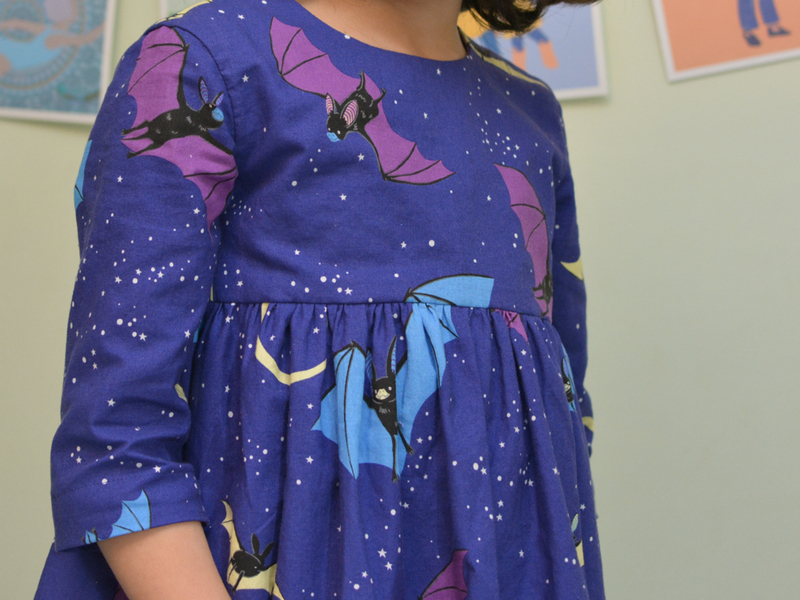 I ordered some Alexander Henry fabric called Bellatrix the Bat and decided to make another Made By Rae Geranium dress. 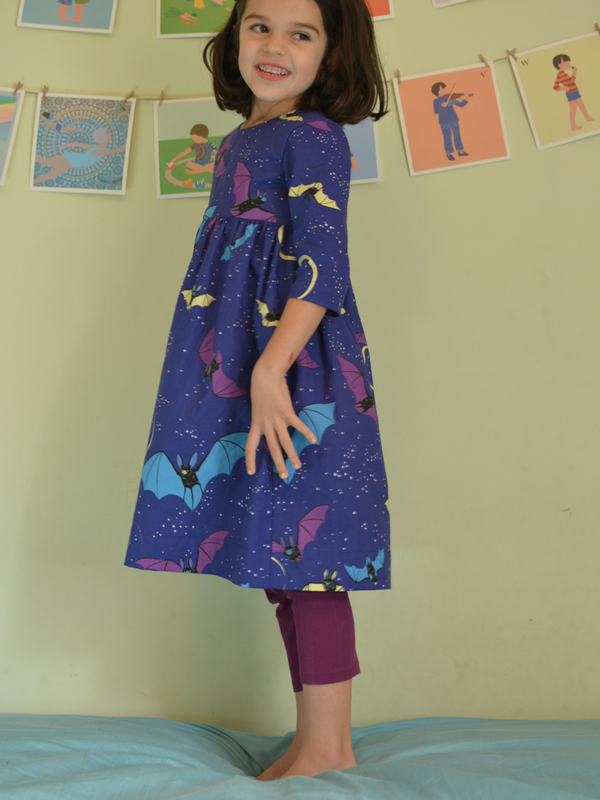 This is my favorite dress pattern and I knew I had to make at least one more in size 5. For fall and winter wear I wanted to add sleeves, as I saw Rae do here. I wasn’t sure how best to approach sleeves in a lined bodice so I asked Rae for help and was kindly pointed in the direction of this tutorial. I used the sleeves from the Oliver+S library dress in size 4, adjusting the armhole openings to match, and it worked perfectly. I do really hope that Rae puts out an expansion pack for this pattern as she hinted in her recent post. Sleeves, collars, and closure options for this pattern would be so fun. The bodice pieces are a size 5 with 1 inch of length added. 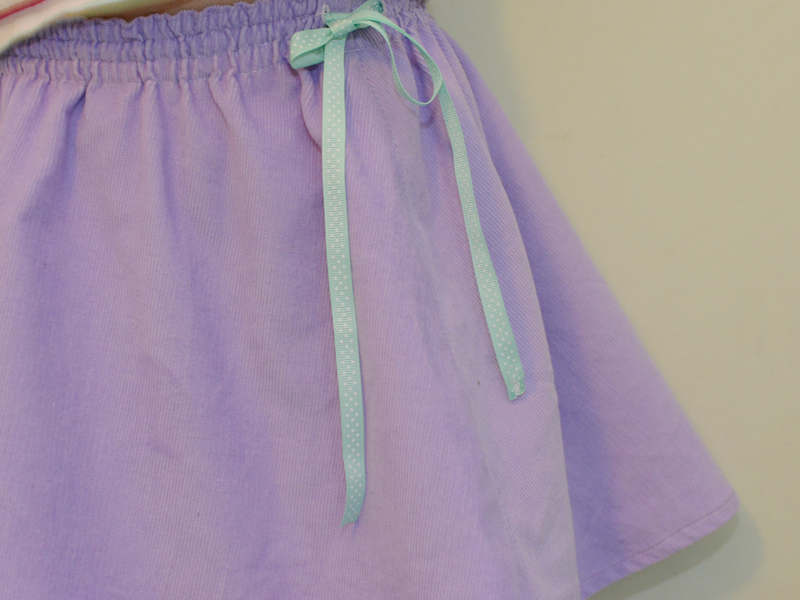 I also added extra length and width to the skirt pieces and used a 2 inch hem which hangs very nicely. I used almost all of my 1 1/2 yards of fabric and didn’t have enough to match the prints, but oh well. 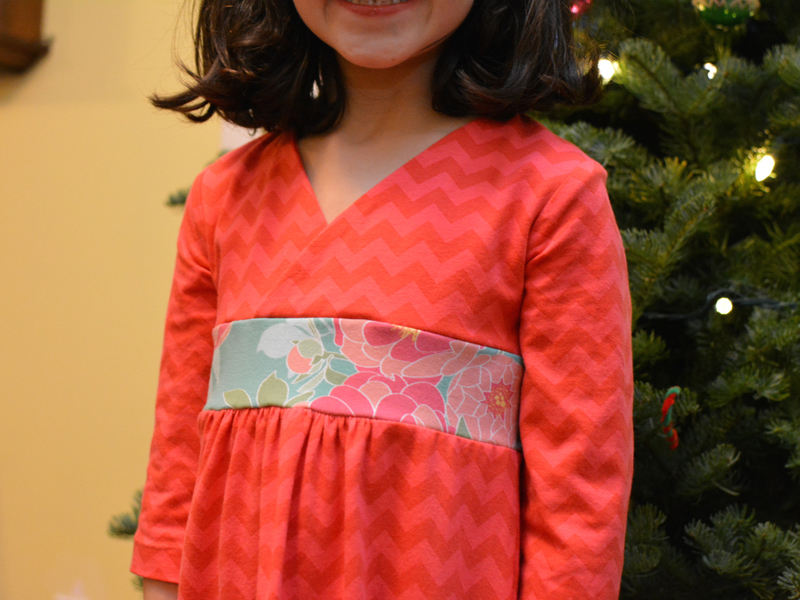 I know this is a pretty wild dress, but I love the colors in the fabric and E was happy with the results. 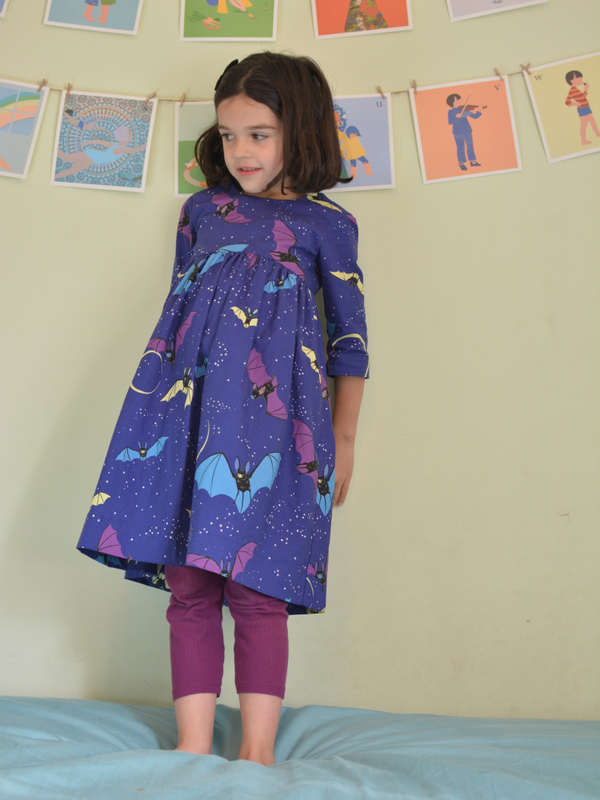 She has decided (as of yesterday) to be a bat for Halloween so this dress will be a good base for her costume. I’m thinking a headband with bat ears and some quick wings like here will finish off the outfit. 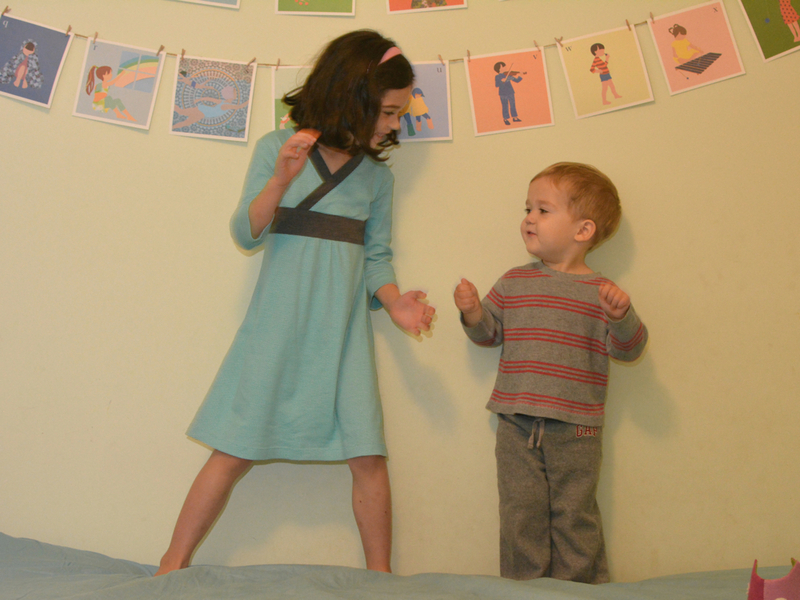 Until then, E thought it was perfect for dancing around and book reading. On a side note, we just finished reading Gooseberry Park and its sequel by Cynthia Rylant and Arthur Howard, featuring a lovely cast of quirky animals (including a bat or two). We thoroughly enjoyed both books, as we do the Mr. Putter and Tabby series from the same duo. With kindergarten taking up so much of E’s time I’m always happy when we can squeeze in some extra book reading. And on that totally unrelated to sewing note, I end my KCW. 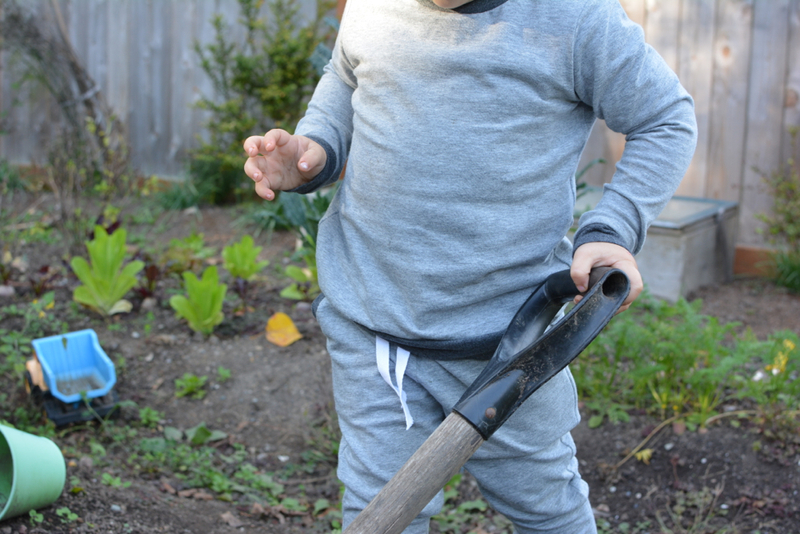 It’s Kid’s Clothes Week, fall edition. The theme this time is disguise, perfect for Halloween. Unfortunately my children are indecisive about what they want to be so I’m just making some basics that can also be used as costumes. Last year’s costumes (Anna and a moose) are still getting quite a bit of use as both regular and dress up clothing. So I’m hoping to repeat that this year, making costumes that are really just things the kids need anyway. Come to think of it, that’s kind of double disguise. And a two-year old with no interest in standing still for pictures, even with help from his sister. O may or may not be a cat, so I figured a gray top and bottoms would be a fine base. Both are made from Kaufman laguna jersey knit in heather gray with heather pepper trim. The pants are another pair of True Bias mini hudsons, this time in 3T. I finished off the waistband mostly as recommended (the elastic on his other pairs tend to flip so I wanted to try the topstitching this time) except I ran twill tape in one buttonhole and directly out the other and tacked it down rather than running it all the way through. 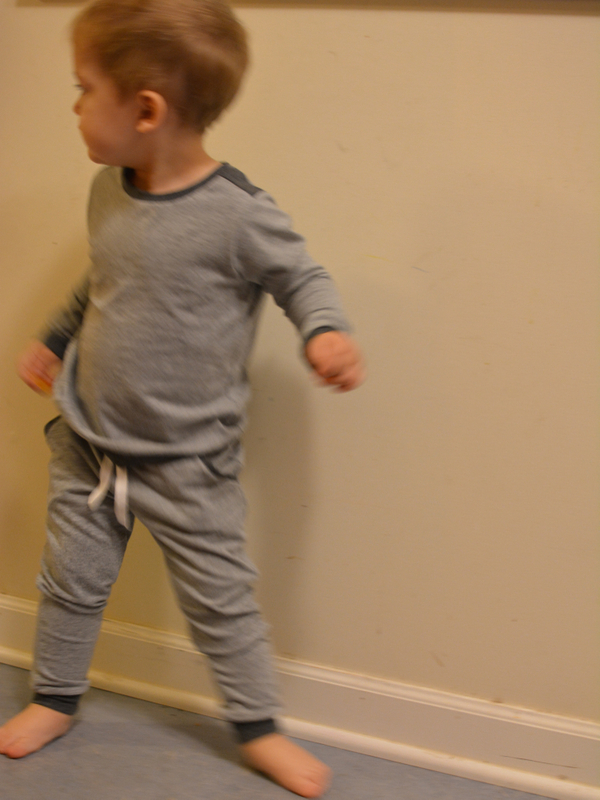 The heather gray jersey felt particular soft and lovely and I much prefer the drape and fit of jersey to the french terry and sweatshirt fleece I used before. The top is my first try at the Rowan Tee from Titchy Threads. 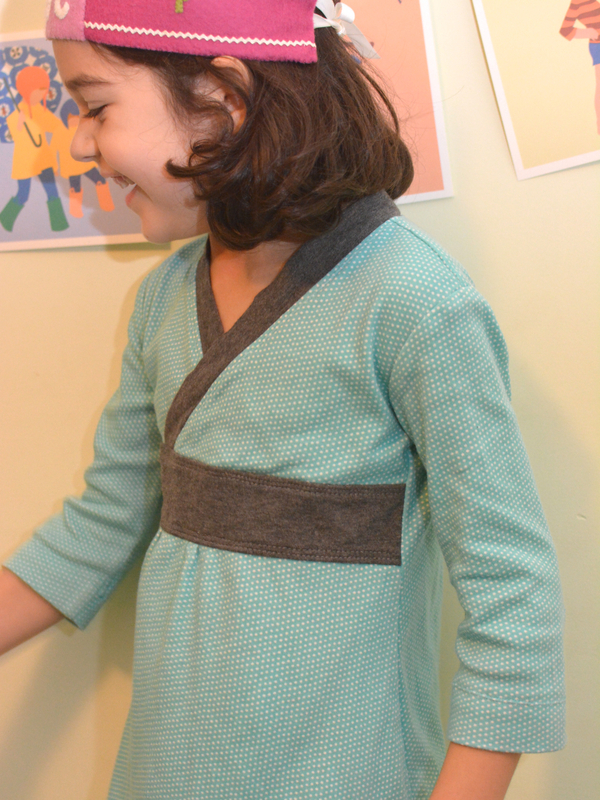 I made a 2T with a little length added to the sleeves and hem. This is a roomier fit than the flashback skinny tee and the extra length was not really needed. But this should ensure it gets a lot of wear and it even fits over a tshirt as in these pictures below. I love the little shoulder band option and am imagining other fun color combinations. This pattern has an impressive number of options and sizes. For digging in the garden, being a cat, or whatever other costume they dream up at the last minute, this will at least be mighty comfy. 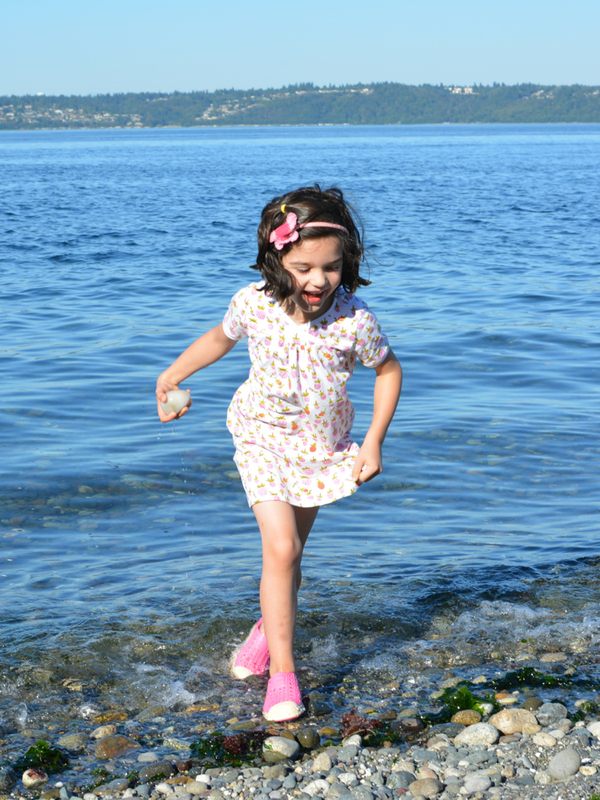 The green library dress I made for E last wear has been worn and loved so much. 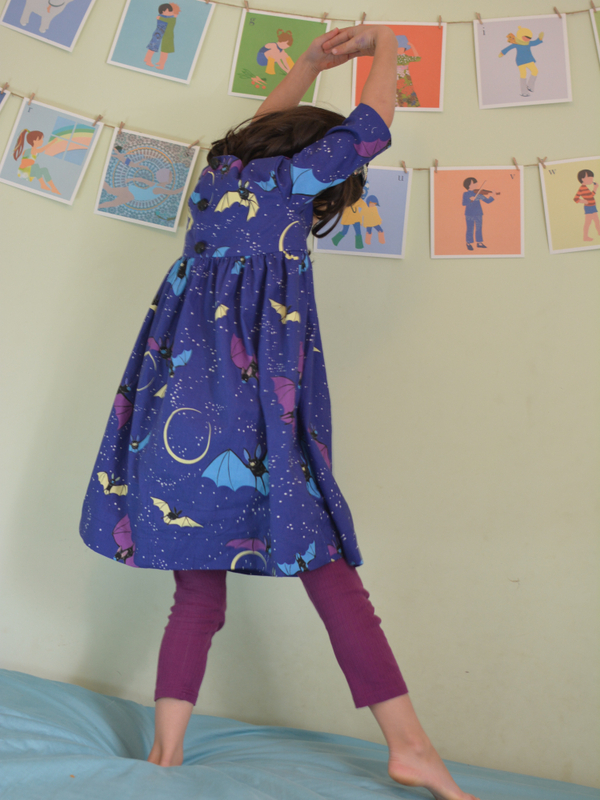 It was made by modifying the Oliver+S library dress for knit fabrics, following this tutorial from Melissa at Meow Made. She’s been after me to make another library dress for months and I finally got it made. Her previous dress (using size 3 pattern as a base) is snug so I used the size 4 pieces this time. I also added some length. The main fabric is City Weekend, Liesl Gibson’s fabric released in 2010. I found some stashed away in a fabric shop a couple years ago and have been saving it for something special ever since. The gray contrast is Kaufman laguna jersey. My pattern pieces didn’t quite line up in the front so I gathered the skirt piece a bit. If I make another one I might run the band piece around the entire dress and maybe make the entire skirt a bit gathered, front and back. I sewed each seam with my machine first and finished the edges with a serger. I’m still working on my hemming skills, however. Right now I’m using the double needle (with polyester thread) and wooly nylon in the bobbin. I think the tension is still a bit off, pulling the stitches a bit more than necessary. I’ve also been hand-winding the wooly nylon thread onto the bobbin after reading that tip somewhere, but I’m not sure if that’s making things better or worse. I haven’t investigated using my walking foot or stretch thread yet, so those are other options to consider. 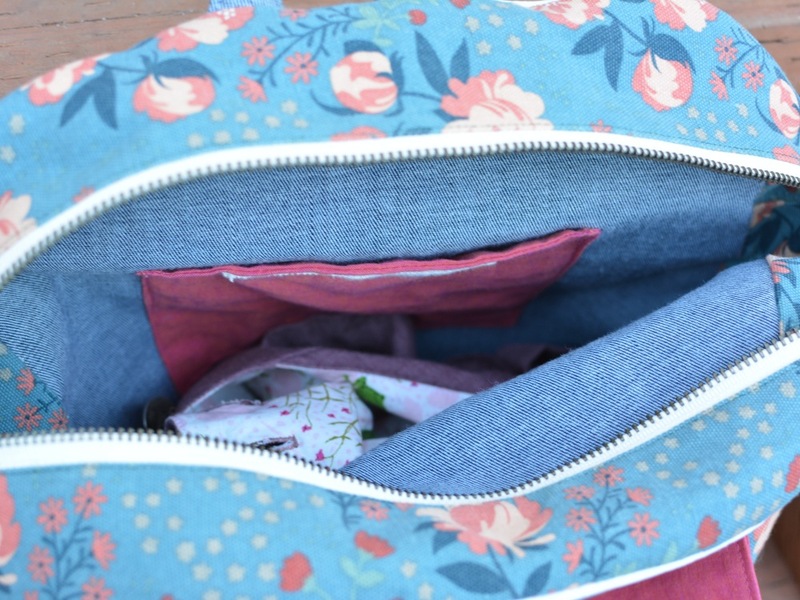 I was so close to buying a cover stitch machine but just couldn’t decide which one to get and whether it would be worth storing and bringing out another machine to the kitchen table when I sewed. Anyway, even with less than perfect hems this is such a wearable dress and I love the colors. If I had more time I’d be tempted to make her an entire wardrobe of these. E would probably approve. She grabbed this dress out of the clean clothes pile and insisted on wearing it today. We got a few pictures before heading off to school. Of course, O wanted in on the fun. These two crack me up every day. O needs some new pants, so I’m trying out some of my pants patterns to figure out what fits him best. 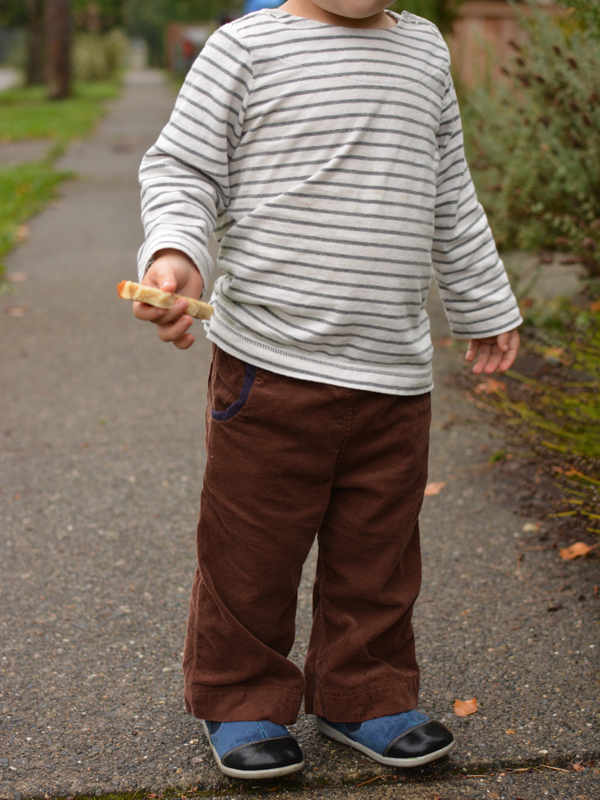 First up, Oliver+S sandbox pants in Kaufman corduroy with navy knit for front pocket trim and waistband. I actually made a pair of these in a smaller size a year ago and they were a complete disaster, not even remotely fitting over O’s diaper. This pair was more successful, but not without some frustrations. I like the knit waistband on these and I think they’re more comfortable and easier for him to pull up and down (we’re in the middle of potty training) than a drawstring. I love the little back pockets, but overall the fit on these feels a little funky. The rise on the back seems too high and the pockets too low. 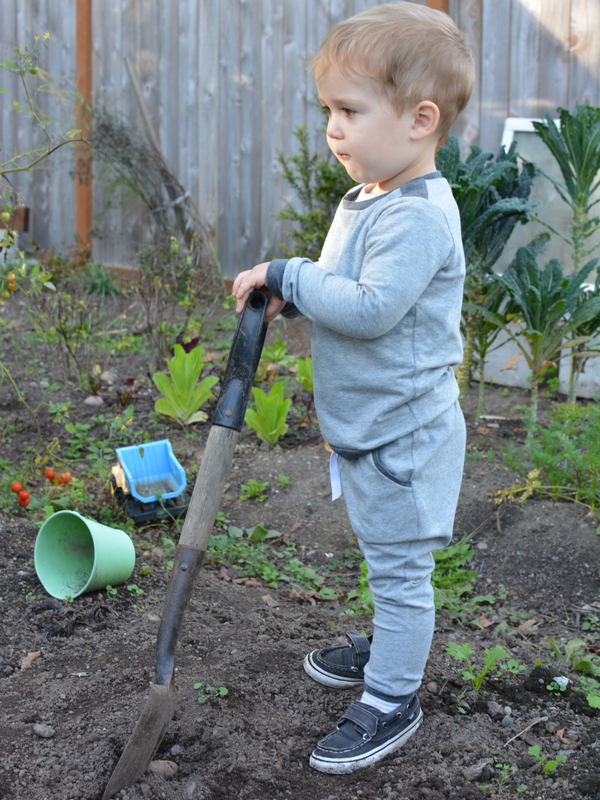 I think 2T Oliver+S are designed to fit over diapers, and O is wearing a disposable in these pictures. O is tall for his age so I should have added length as they are just barely long enough. The pant legs are also fairly wide, which is tricky with boot season coming. I contemplated trying the pattern again with a longer/thinner fit and shorter rise/higher pockets. But with many other pants patterns to try, I think I’ll just move on. So, more boy pants, Halloween costumes, and KCW prep up next. 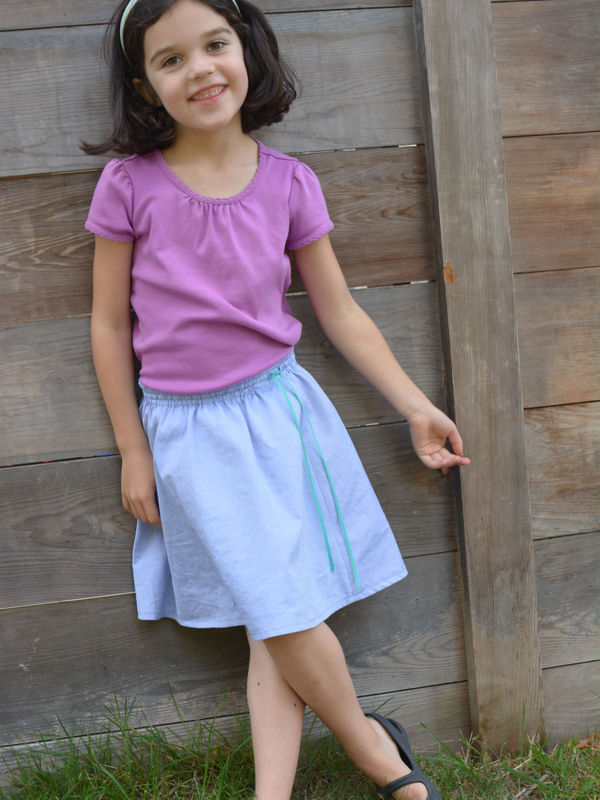 I’ve had my eye on the Oliver+S swingset skirt for so many years. 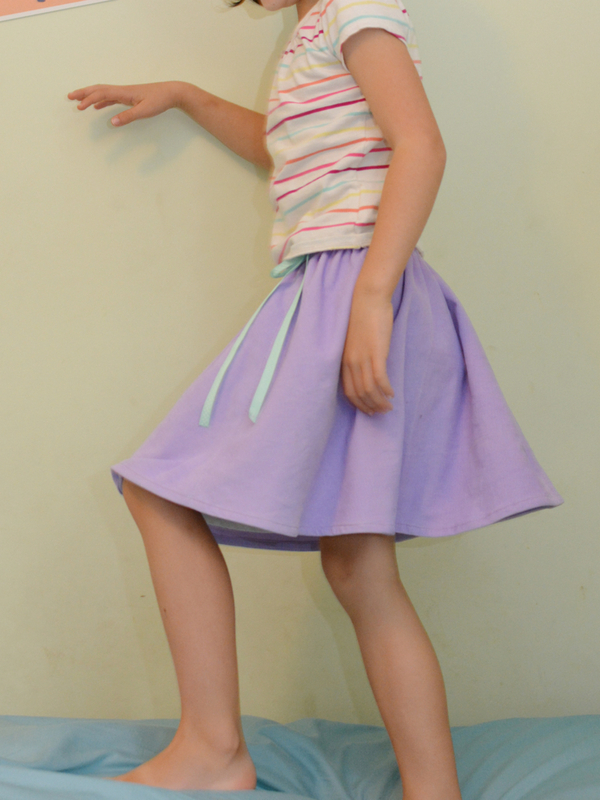 But E had other skirts that she wasn’t outgrowing (skirts have a ridiculously long life compared to other articles of clothing, I’ve found) and so I just never got around to buying the pattern until now. My pattern only goes up to size 5 so I knew I needed to get moving. 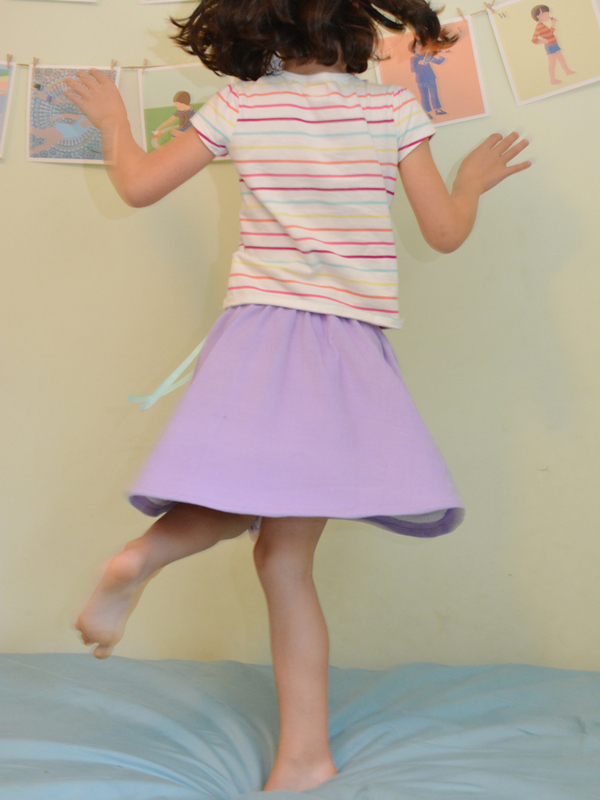 But I was happy to see that the pattern was rereleased yesterday (going up to size 14), so there can be more swingset skirts in our future. 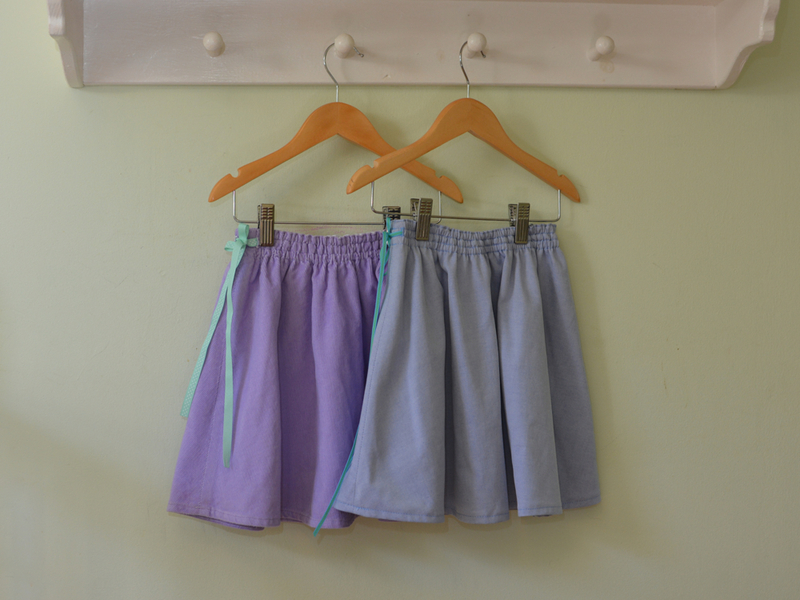 Both skirts are a size 5 with one inch of added length. E prefers to wear her skirts low on her waist so the extra length was probably not necessary but should extend the wear. The first one I made is purple corduroy with a lightweight white cotton for the lining. This is a simple pattern and my only problem was getting the elastic evenly distributed around the skirt. It tended to bunch up on whatever side I’d inserted the elastic through but I’m hoping the ribbon covers up some of the bunching. I think the ribbon is a cute feature but they are constantly coming undone. I may need to just tack a little bow or ribbon in place because E is always fiddling with them. Any hints on elastic or ribbon would be welcome. 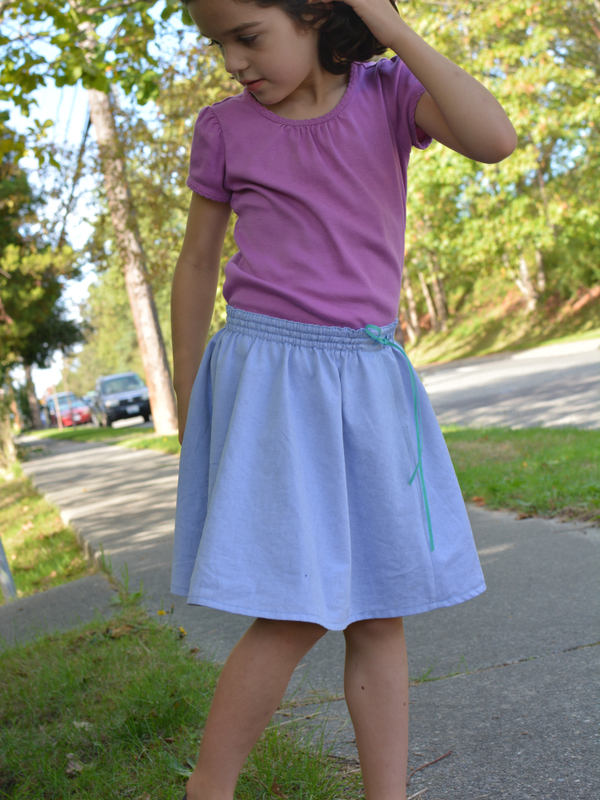 The other skirt is a Robert Kaufman shirting (same as the nightgown I made here). I used the same fabric for the lining pieces because it’s what I had on hand and I’m really trying to get my fabric stash down to a couple bins. In other news, this gal is finally a kindergartener. Schools were delayed with a strike, pushing our already late start date even later. E is exhausted but happy. We miss having her around but we are settling into our new routine. And I’m also looking forward to having a bit more sewing time after a busy summer. Summer has been very slow on the sewing front. 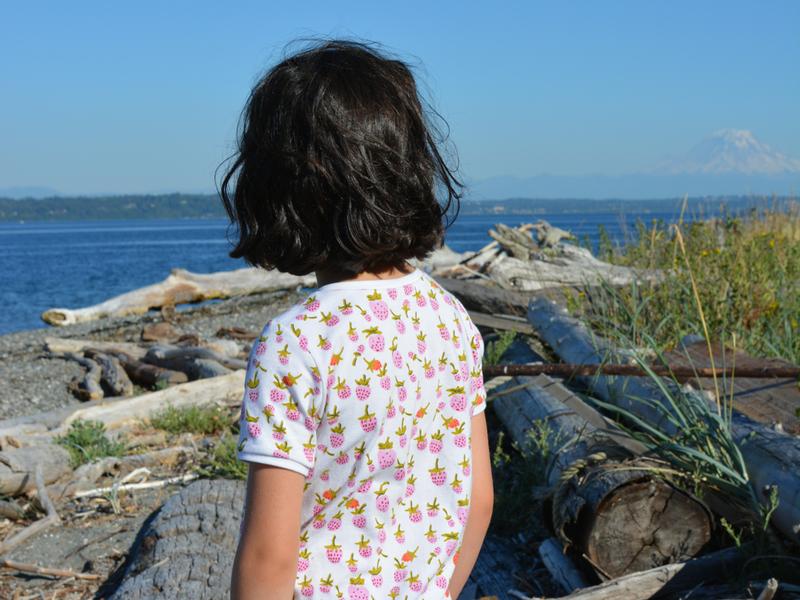 We’ve spent some time camping and vacationing and without preschool I’ve found my free time to be limited. 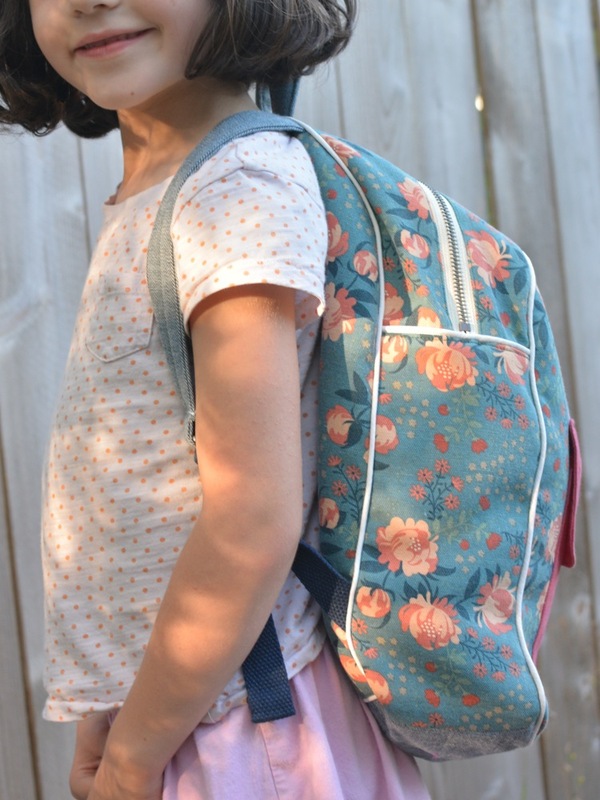 But E is starting kindergarten this year and she’d long ago picked out fabric for a new backpack. With a kindergarten orientation camp looming, I got to work. 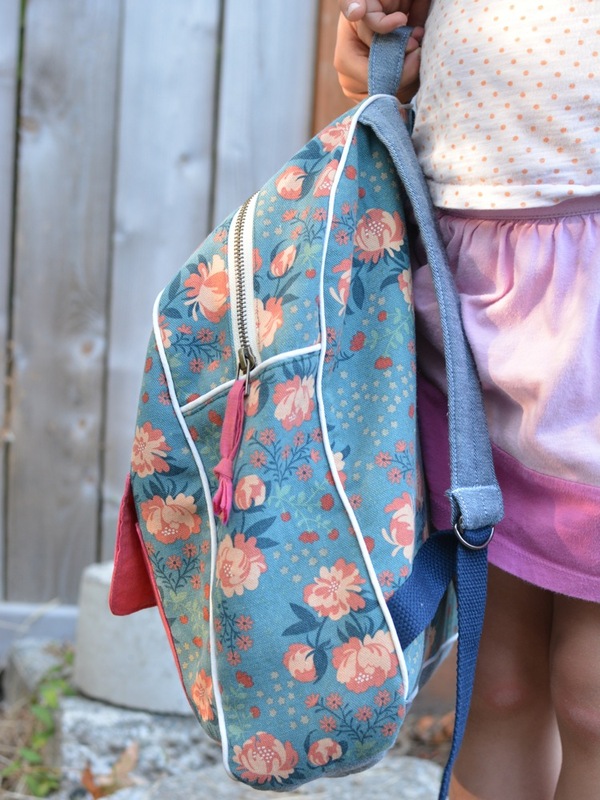 E used this backpack for preschool and while it is a darling pattern it is quite small. 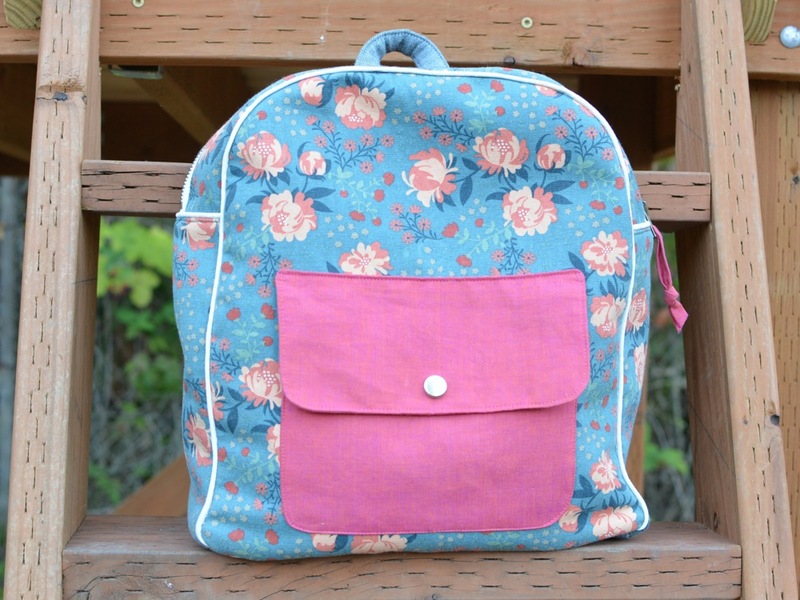 So this time around I used the Made By Rae Toddler Backpack pattern. The main fabric is a lovely canvas from the Acorn Trail Line. 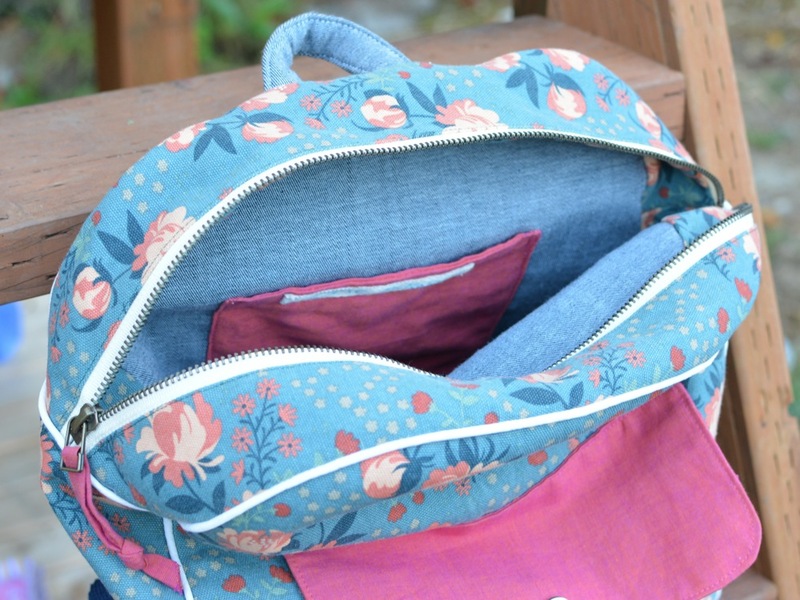 I also used denim, salmon/pinkish shot cotton, navy blue webbing, cream colored piping, and this metal zipper. I made a few changes to the pattern. I increased the size (following directions included in the pattern) so it would fit a normal folder. To add structure I used fusible fleece or interfacing on all exterior pieces. 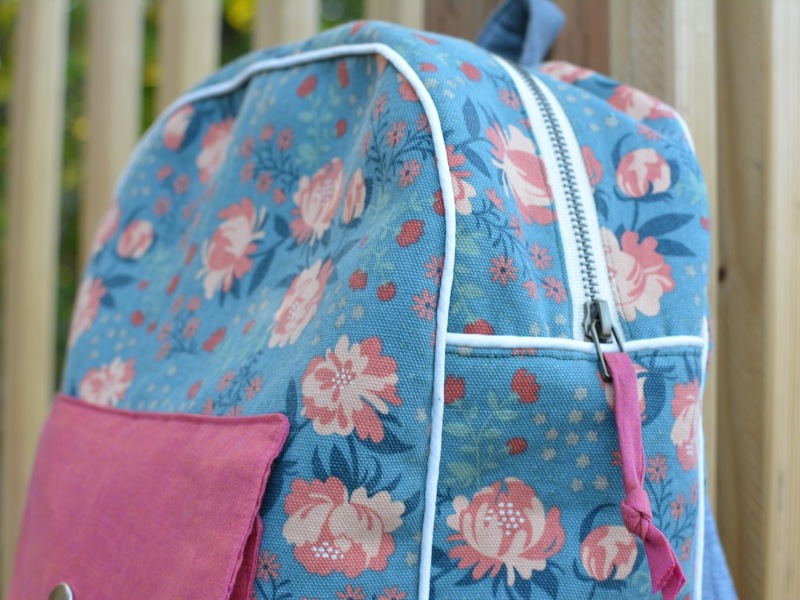 I also felt the backpack needed pockets, so I added exterior and interior pockets from the Noodlehead Sidekick tote pattern. I also sewed the lining in by hand. With fleece, canvas, denim, and piping to sew through I had to take things slowly in a few places. But my heavy-duty machine was a champ and made it through. There wasn’t anything tricky about this pattern but it was a slow project- I spent a couple of late nights trying to get it finished up in time for E’s kindergarten camp this week. It does feel nice to send her off to a new place with something I made. Because kindergarten. I’m kind of in shock. 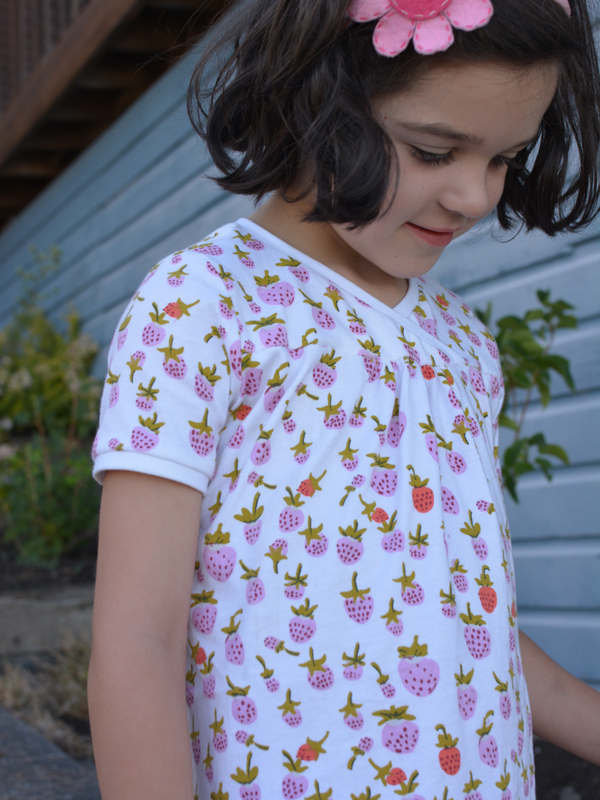 Just in time for a Strawberry Festival visit, a strawberry dress for E. This is an Oliver + S hopscotch dress in a Heather Ross knit. I made this dress one time before and after rereading my notes and the comments I remembered how small this pattern runs. I decided to buy the bigger size range and sew up a size 6 (rather than the lengthened size 4 I’ve been sewing lately). I didn’t make any changes to the pattern except to bind the sleeves with a little cuff instead of hemming. I also skipped the interfacing on the front because I didn’t have the correct kind on hand. This made the front a bit floppy and the seam allowance doesn’t like to lie flat. In the future I might add a little piping/trim along that seam. Or perhaps topstitch? Now that I have the pattern thought size 12 I have plenty of time to experiment. I did notice that the stitches on the bottom hem have already pulled out in a few places. I need to figure out the best combination of needle, stitch setting, and threads. Mostly I just want to buy a coverstitch machine. I often admire the lovely stitching on our store-bought shirts and wish I could recreate those finishes. 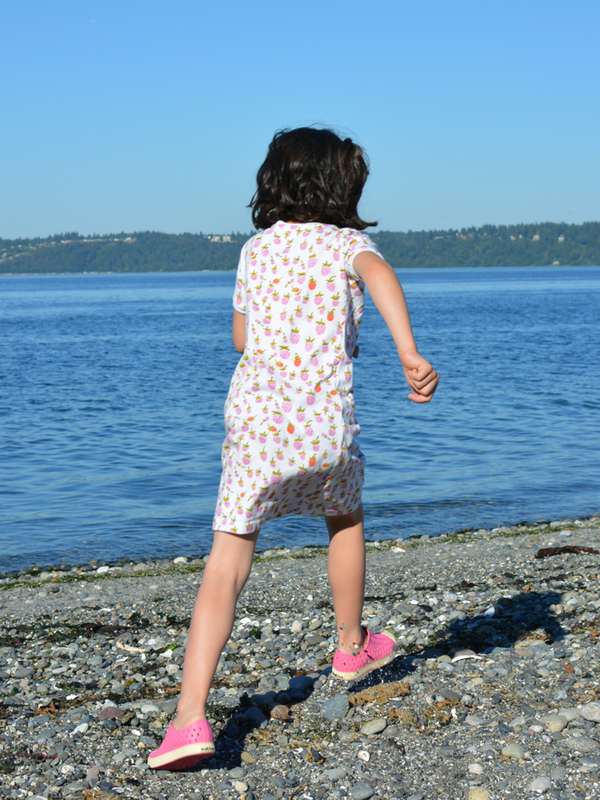 A simple little dress, perfect for play.